Notice anything interesting? You can see where I started, in the top of the graphic. I flew southwest to Charlottesville, then southeast to Richmond, then northwest, back to Charlottesville. Then I flew.... "Wait a second," you might be thinking, "there's only one flight shown between Charlottesville and Gaithersburg....."
Yep. 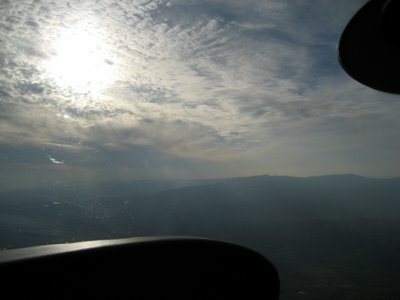 For the first time in my flying career, I got stranded. The flight down was beautiful. It's the peak of the leaf season, as you can see in these photos. Although it was cloudy, it was the beautiful kind of cloudy. Here's a little video of the flight down to Charlottesville. I picked David up in Charlottesville, then we took off for Richmond to pick up Jessica. David's in Charlottesville for a month doing a clinical rotation as part of his medical training. Jess flew to Richmond on Southwest Airlines to spend a few days and look the area over as a possible place for them to move. The flight down to Richmond was about a 30-minute flight, saving David about a half hour or so of driving. We picked Jess up without incident, then flew back to Charlottesville while the last remnants of the sunset faded to black. I had the plane refueled while Dave and Jess got their things together and left, then started the plane and taxied to the runway. I did a quick runup to check the operation of the engine, as I always do before taking off. The airplane has dual magnetos, and part of the runup is to check the operation of the engine while shutting down one of the two magnetos. I shut down the left magneto and everything was fine. Then I switched to the left and shut down the right magneto. The whole plane shook violently while the engine made violent clanking noises. I switched back so that both magnetos were working and everything smoothed out. I tried again, and got the same results. The left magneto had a problem. The reason for the dual magnetos is simply safety. The magnetos make the spark plugs fire, and with two, parallel systems, the engine will continue to run if something happens to one magneto or some other part of the engine ignition system. 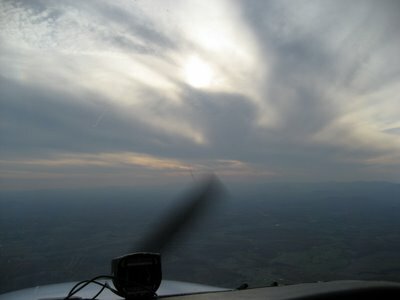 Running on both magnetos, or on just the right, the engine ran fine, and I could have taken off and arrived home safely. On the other hand, I would have been taking off into the dark night, and if the engine had quit, I would not have been able to see a safe place to land. I love flying at night, but I wasn't willing to do so knowing that I didn't have the redundancy of two properly operating ignition systems. The maintenance person at the FBO was out and couldn't look at the plane until the following morning. I called a few people in my flying clubs to get get advice. A few people were willing to fly down and pick me up. It was only a 2-1/2 hour drive, though. In the end, I was told my flying club would pay for a rental car. The people at the FBO gave me a ride to the Hertz counter at the main terminal and I hit the road for home. So 30YR sits at the Charlottesville airport. The mechanic will look at it on Monday, and people from my club will have to make a run down to pick it up. I wouldn't mind making that trip, as it's a beautiful flight. I'm sure this won't be the last time I am stranded somewhere. In fact, if I ever own a plane, I may just keep a sleeping bag in the back as a hedge against this happening again. I had to appear in court in Hampton, Virginia, on Tuesday morning. I reserved the Cardinal and planned to fly down Monday afternoon, then back on Tuesday after the hearing. It would have been a perfect trip for the utility of a small plane. By car, it's about 200 miles, three and a half hours. By air, even taking into account the deviations because of security restrictions that I wrote about before, it's only 140 nautical miles. In the Cardinal, cruising at about 120 knots, it would have been a little over an hour of flying time. Financially, it also made sense for the client. The mileage rate these days is $0.485 per mile. For a 400-mile round trip, it cost my client nearly $200 in mileage and 7 hours of my time. If I'd flown, it would have been about 2 tach hours on the Cardinal at $83 per tach hour, for an expense cost of $166. As far as my time goes, it would have been a total of about 3 hours of travel time. In all, driving instead of flying cost an extra 4 hours of my time (about $1,400), and $35 in travel expenses. Alas, the weather was not forecast to be good for my return trip on Tuesday. The cloud ceilings were expected to be too low. That wouldn't have stopped me if I'd had my instrument rating, something a half dozen pilots reminded me of when I sent out an email canceling my plane reservation. In fact, I might have been able to go even without an instrument rating, just flying at a lower altitude than I would have otherwise. But I just couldn't be sure that I'd be able to get home. I knew what the conservative decision was. So I drove instead, and spent about 7 hours of quality time with my iPod and whoever I could reach by phone. Of course, the weather on Tuesday was fine until about 2-3 hours after I would have landed at my home airport. I could have flown. At the end of the hearing on Tuesday, the judge ordered us to appear again on Friday morning. I scheduled the Cardinal again, and watched the weather. Once again, mother nature was against me. I needed to be in Hampton by dinnertime on Thursday to prepare a witness to testify at the hearing. I watched the weather closely. Thursday morning arrived with a low cloud ceiling and freezing temperatures just a couple thousand feet in the air, but it was forecast to clear up by mid-afternoon. If I was going to drive, I needed to leave by 2:30 or so. At 1:30, the clouds were still low, there was some rain, and the freezing levels were at or below 3,000 feet. It just wasn't safe to fly. So I made the decision, canceled my airplane reservation, and headed out the door for the long drive. By 3:30, the clouds had lifted, the sun was shining, and it was beautiful. I could have flown if I had waited another hour. On Friday, I left Hampton about 11:30 to drive back to Washington. The traffic was terrible, barely moving, adding about two hours to the drive. 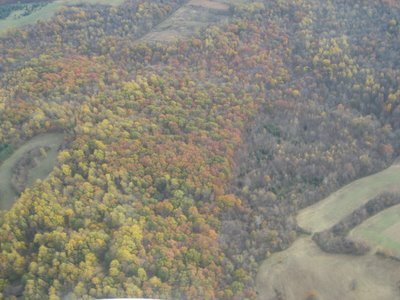 As I sat in the traffic for five hours, watching the sun play on the colorful fall leaves fluttering in the light breezes, I repeated over and over in my head, "Better to be on the ground, wishing...."
I think Cessna Cardinals are beautiful planes. Since I started flying two years ago, I have flown Cessna Skyhawks almost exlusively. 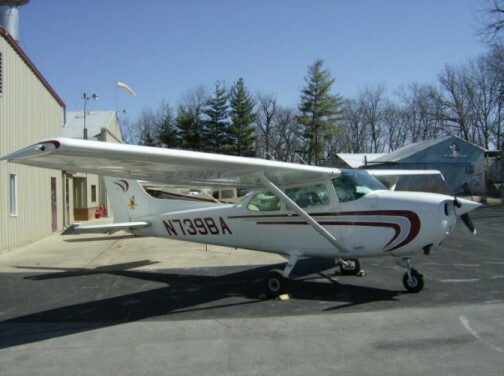 The one exception has been a Cessna 152, which I wrote about previously. Cardinals are similar to Skyhawks in that they are four-seat, single-engine airplanes. Some Cardinals have retractable landing gear, but most, like Skyhawks, do not. 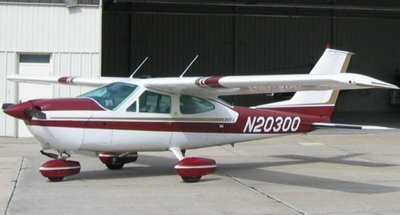 When I first started flying, I had trouble seeing the difference between the Cardinal and Skyhawk -- to me, a four-seat, high-wing plane was a four-seat, high-wing plane. Notwithstanding their similarities, though, Cardinals are different from Skyhawks in several important ways, and if you compare the two pictures above, you'll be able to pick out some differences. Cardinals are sleeker, with cantilevered wings instead of wing struts. They have much larger doors, and are more spacious inside. With the exception of the first year Cardinals were produced, they also have engines that are more powerful than most Skyhawks, with constant-speed propellers instead of fixed-pitch propellers. This all translates into smooth, faster flight, and quicker handling makes them seem more like sports cars than the Skyhawk family sedans. On Friday morning I finally got checked out in my club's Cardinal, pictured above. Rich met me at the airport at 6 a.m., we spent some time going over the plane, then we went flying. I had read as much as I could about Cardinal systems and operations, but Rich really helped me understand the flow. Adjusting the prop was new to me, as all the planes I had flown before had fixed-pitch props. The view out the window was also different -- the wing is closer to eye level and further back than on a Skyhawk, and that made me feel different during turns. It took just a little getting used to. Rich and I flew out to Westminster, where I practiced power-off glides, steep turns, and stalls, then we headed for Carroll County airport for some takeoffs and landings. I did three takeoffs and landings, including one short-field landing. All of the landings were good, and the short-field landing was great. The Cardinal has a stabilator instead of a horizontal stabilizer and elevator. When it was first produced, the light touch of the elevator controls gave the Cardinal a bad reputation for being squirrelly in the landing flare. To me, though, the sensitive pitch control was wonderful, and really made it easy to modulate the attitude of the plane. Rich and I took off to head back to Gaithersburg and I climbed toward 3,000 feet so ATC could "see" the plane on their radar. If they can't see us, they won't give us clearance to re-enter the DC ADIZ. As we were climbing, though, it began to rain. Rain is typically not a huge deal. In fact, rain had been forecast to start, though not until 11 a.m., and it was barely 8:00. It was new to me, though, as I had never flown in it, and I was interested to see that the air from the propeller kept the windscreen clear. I noticed the engine RPM dropping a little, so I pulled the knob for carburetor heat. The RPMs dropped further, then increased back to where they should be, confirming that ice had been building up in the carburetor. Then I noticed some airframe ice, about 1/4-inch, on the leading edge of the wing, and Rich pointed out a patch of ice on the front of the landing gear. Ice on an airplane is bad. The ice does not build up smoothly, so it spoils the smooth flow of air over the wings. It is also heavy, dragging the plane down. We had only a little ice, so there was no immediate danger, but we needed to get out of the rain and freezing temperatures. ATC finally told us that they could see our transponder, allowing us to re-enter the ADIZ, so I pointed the nose of the plane down and toward Gaithersburg, descending rapidly while making a beeline for the airport. The ice stopped building as we descended into warmer temperatures. Then it started snowing. The effect was something like going "light speed" in the Star Wars movie as we headed toward the airport as fast as the plane would take us. I loved flying the Cardinal. It handled great (with or without a little ice), was comfortable, and the constant-speed propeller was smooth and efficient. I greased in a landing at Gaithersburg, and Rich filled out my logbook before heading to work. It had been a significant flight: a new plane (to me), and an introduction to flying in rain, snow, and icing conditions. It was only 8:30, but I was already tired from the excitement of the morning, and I headed to the airport cafe for some food and more coffee. I was curious to see what Rich wrote in my logbook. I sat down at a table in the restaurant, ordered an omelet, and flipped open my logbook. After a brief description about the Cardinal checkout, it said simply, "Winter familiarization." Indeed. Love of airplanes and love of flying are viruses. For someone who has the bug, it is difficult to understand why not everyone is so enthralled. Call it fear, nervousness, practicality, thriftiness, whatever -- from what I can tell, some people are simply immune to the joy and thrill of flight. Others are susceptible to infection, and just need exposure. When I first started my flying lessons, it was the fulfillment of something I had been dreaming about since I was quite little. Realizing that the ability to fly an airplane was something an average guy like me could attain, I was puzzled that not everyone was as excited as I by this Good News. So it is with great joy that I occasionally discover someone else who is intrigued enough to be potentially infected by this viral infatuation. AOPA's Project Pilot mentor program is a means whereby a pilot (with the requisite disease) can provide advice and guidance to aspiring student pilots. For me, I just enjoy meeting even more people who want to talk about flying. I volunteered for the Project Pilot program a few months ago, and my first mentee, Aykut, has now soloed and is working on his cross-country training. Happily, I think I have reeled in my second Pilot Project. Amy is an attorney in my firm and appeared immediately susceptible to aviation, though she hadn't been in a small plane. We originally aspired to get her signed up with an instructor so that she could have her first lesson before her 30th birthday. That didn't happen, due to busy schedules, but we did at least get her into the air. We went for a flight last night, just a few days before her birthday. She took a bunch of pictures, which she posted on Shutterfly and gave me permission to use here. All of the pictures (and amusing captions) are hers. When Amy arrived at the airport, I introduced her to an instructor from my flying club, who would be happy to work with her. 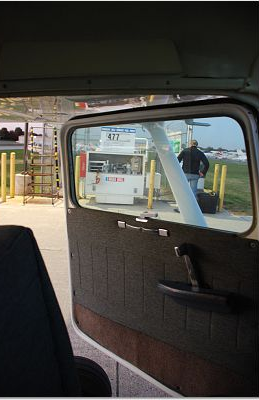 He suffers from a bad case of aviation -- he works for one of the big aviation government contractors and I found him just sitting in his truck at the airport, just to be near the planes, I think. After the introduction, I spread out a sectional chart and gave Amy a brief introduction to the airspace around the Gaithersburg, MD, airport. I explained about Class B shelves, the DC-ADIZ, and P-40, the Camp David prohibited area which was to be expanding later in the evening. "Mind the rings, young jedi." Amy then listened while I called Flight Service on the speakerphone for a standard weather briefing and to file DC-ADIZ flight plans. I had already briefed myself fully on the weather, and I prefer to file flight plans by computer. But with Amy listening, I could point out airports on the sectional as the weather briefer gave METAR and TAF information, helping to give her a broad picture of the weather. Amy helped with the preflight inspection, reading each item off the checklist while I checked it, pausing occasionally for me to point out parts of the airplane. "Time to buzz the tower, Goose." "The art of parallel parking." After the preflight inspection, she got in the plane and made engine noises while I took a picture. I like to make first-time passengers do that: if their nerves give out before the propeller starts spinning, it's a bad sign. "Take me to your leader." Amy didn't change her mind about going, so I finished putting together all my gadgets, then started the engine to taxi for takeoff. "Ohh la la. Check out the gadgets." "Greg, playing with the gadgets." We took off and I headed north toward Sugarloaf Mountain, then west toward Harper's Ferry, West Virginia. 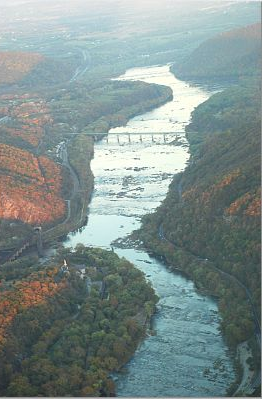 Harper's Ferry is a favorite sight-seeing destination for me when I take new passengers, such as Dave & Jess, Eric, and Jodie. It's geographically interesting and historically significant due to its role in the Civil War. It's not far from Gaithersburg, and it's fun to follow the Potomac upriver to reach it. The late-afternoon sun cast some beautiful colors on the hills. "Yes, your seat is also a flotation device." After circling around Harper's Ferry, I decided to land in Frederick to fill the plane with fuel. The fuel prices at Gaithersburg are outrageous, so my club tries to fill up at other airports whenever possible. Frederick has a self-serve pump that is about fifty cents per gallon cheaper than Gaithersburg, and the plane we were flying was only half-full when we took off. By filling it at Frederick, I saved the club about $12-15. 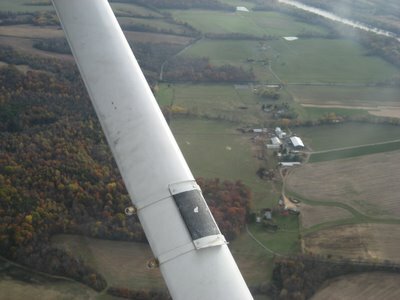 As we headed toward Frederick, I let Amy hold the yoke and fly the plane for a bit. I showed her how to make it climb and descend, and how to bank for a turn. She had the basic feel of it within just a couple minutes. The sunset was gorgeous. I took the controls to descend toward Frederick and Amy snapped some photos. "When do we practice rollovers?" This next photo is my favorite from the entire flight. I don't know that I've ever looked out the back window of the plane while flying. With the sky lit up, it's a beautiful picture. "All together now: Le Sigh...."
I pulled off a greaser of a landing at Frederick, and proceeded to literally and figuratively pat myself on the back. That was when I noticed that my soft drink had been sitting on the floor of the plane the entire flight. The whole flight (including the landing) had been so smooth that it hadn't tipped or moved. "Proof of the soft touch landing." I refueled in a hurry so we could take off and try to catch some photos of the fading sunset, but I was too slow. "Does this thing take regular?" We took off and headed east while I waited for permission to enter the ADIZ, then headed back to Gaithersburg as the last light faded from the sky. During my preflight passenger briefing, I had told Amy that during certain phases of the flight, I would let her know not to talk. Takeoff and the approach to land are two times when there's a lot going on and the pilot is going through a lot of checklists, either by referring to a written checklist or from memory. As we approached Gaithersburg, I told Amy that we could resume talking on the ground. "I don't want to land." My landing at Gaithersburg wasn't perfect, though it was still better than a lot of airliner landing I've been through. After I secured the plane, we walked to the cars. I opened the back of the car and handed Amy three books to get her started on her own license. She later sent me an email with a link to the pictures and a note saying that she thinks she can do this and would like to learn more about the different options for flying clubs. So I'm psyched for a successful recruitment. Of course, this is only the beginning of the indoctrination process, but her caption on the last photo makes me happy. 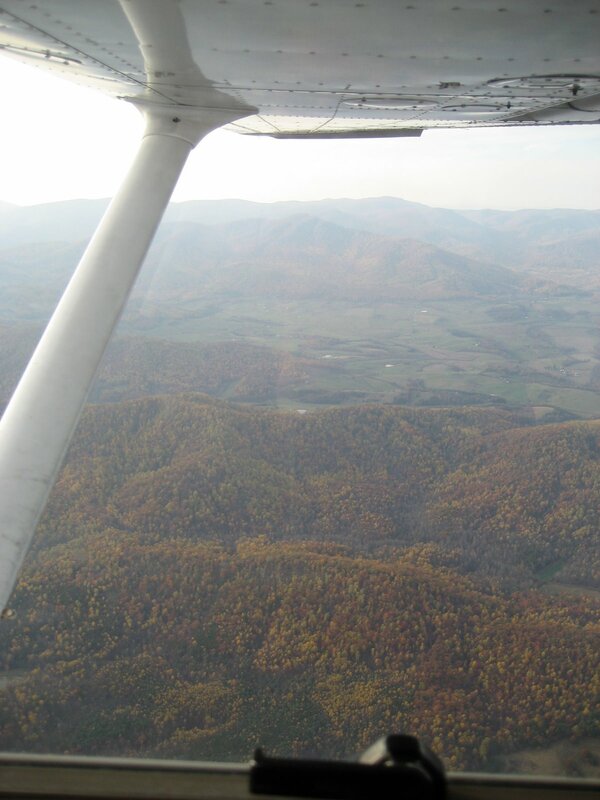 If nothing else, even if she doesn't pursue the license to completion, she'll have this flight as a good memory of how fun and beautiful general aviation can be. A final note: this flight was significant for me, as well, if only because I surpassed the 100-hour mark. 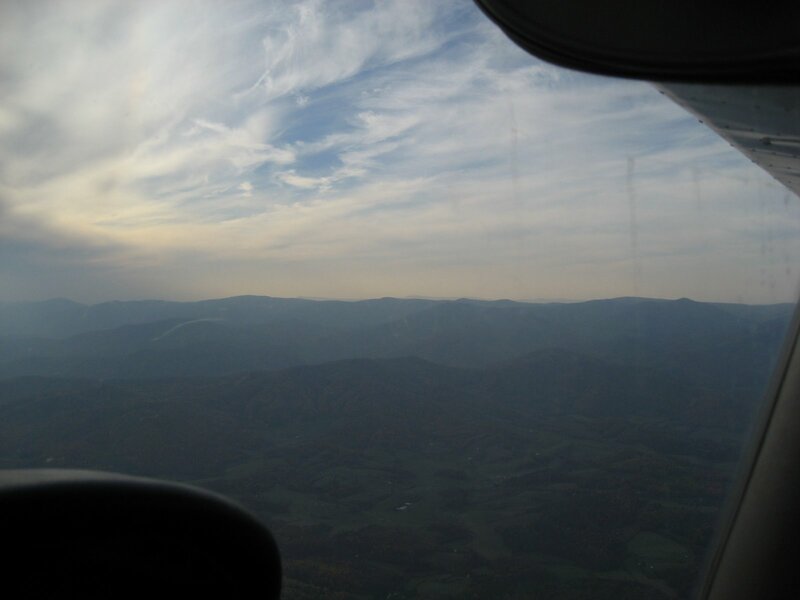 When I shut the plane down at Gaithersburg, I had 100.6 hours of flying time in my logbook. As any pilot will tell you, flying time is not deducted from our allotted lifespans, so more is better!